Many architects delight in tackling renovations of older homes, finding ways to highlight their ancient bones with modern twists. Japanese firm NAAD has unveiled a project with a much different slant. To create Ephemeral House, the team gutted a 100-year-old home and lined nearly every inch of the interior with unfinished plywood for an intentionally rough look. Instead of a popular sleek, polished look, NAAD’s 20-something-year-old client has a temporary home that was designed to look incomplete. 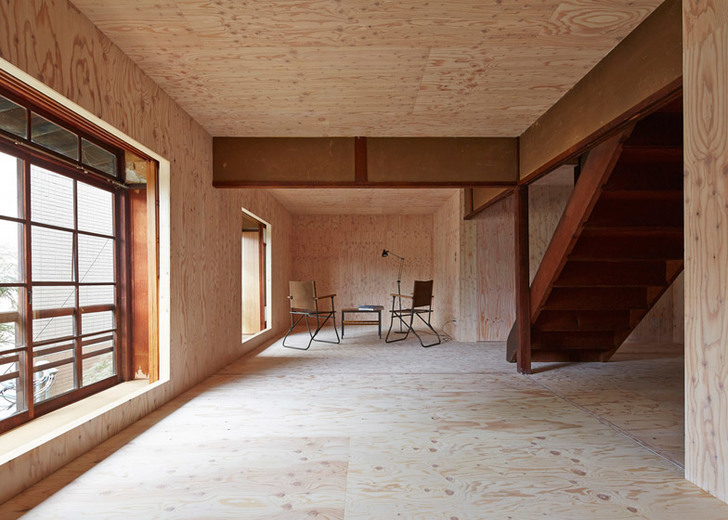 Each room of the timber-framed home is lined with plywood. Left unstained, the plywood covers every wall, floor, and ceiling and makes the house look almost like a construction job left undone. The house, located in Kyoto, is also largely empty. Its sparsely furnished look emphasizes the ‘incompleteness’ of the dwelling. Although Ephemeral House looks dramatically different than a traditional Japanese home at first glance, it does possess some familiar features. Sliding dividers can be expanded to create individual rooms, or left retracted for a more open floor plan. Closing the sliding partitions creates smaller rooms, offering some privacy and coziness in this otherwise stark space. A solid staircase rises through the center of the structure and is perhaps the only surface not lined with untreated plywood. 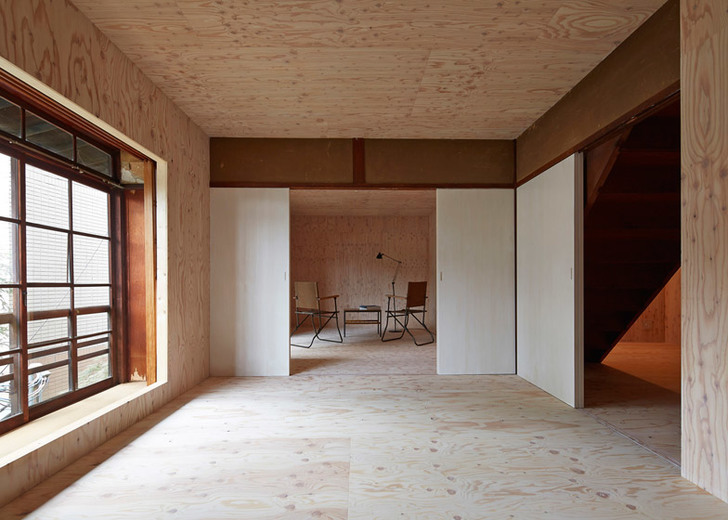 Architects Yoichiro Hayashi and Shogo Sakurai designed the home with this ‘unfinished’ aesthetic at the request of their young their client, who wanted a temporary place for living—and nothing more. He could have just moved to Detroit. Images via Keishiro Yamada for NAAD. Each room of the timber-framed home is lined with plywood. Left unstained, the plywood covers every wall, floor, and ceiling and makes the house look almost like a construction job left undone. The house, located in Kyoto, is also largely empty. Its sparsely furnished look emphasizes the ‘incompleteness’ of the dwelling. A solid staircase rises through the center of the structure and is perhaps the only surface not lined with untreated plywood. 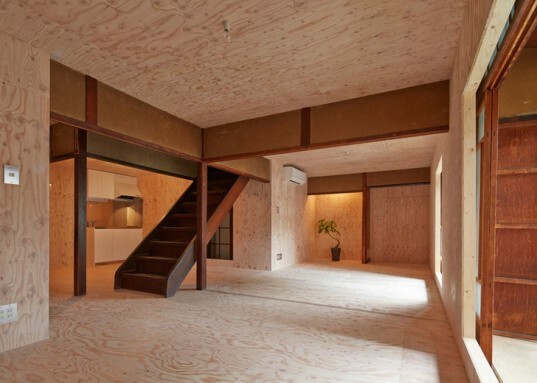 Although Ephemeral House looks dramatically different than a traditional Japanese home at first glance, it does possess some familiar features. Sliding dividers can be expanded to create individual rooms, or left retracted for a more open floor plan. Closing the sliding partitions creates smaller rooms, offering some privacy and coziness in this otherwise stark space.